Sandworm - ZineWiki - the history and culture of zines, independent media and the small press. Sandworm was a science fiction and fantasy fanzine edited by Bob Vardeman. Sandworm was published in Albuquerque, New Mexico, U.S.A. The first issue was released in 1967, with # 6, #7, and # 8 published in 1969, # 18 was released in 1972, and the last issue, # 19, appeared in 1975. Sandworm was included in the APA APA-45. Sandworm featured the regular column "Mindswap" by Dean Koontz (SF Opinion), which appeared in 4 or 5 issues. Other contributors included Alexis Gilliland, Jim McLeod, and Darrell Schweitzer. Contributions of art work came from Grant Canfield, C. Lee Healy, and Jim Shull (The Essence). Letters came from Robert Bloch, Andrew Offutt, and Harry Warner, Jr. (Horizons). 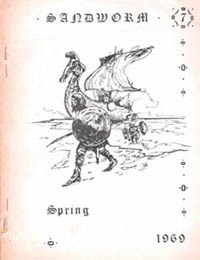 Issue 12.5 was The Sandworm Songbook, a collection of 'filk songs'. Issue 19 featured the supplement Hugo(es) There?, a one shot con report, with a cover by Jim Shull. Robert E. Vardeman later went on to write over fifty science fiction, fantasy, and mystery novels, including the Cenotaph Road series, The War of Powers series (with Victor Milan), The Swords of Raemllyn (with George W. Proctor, co-editor of Citadel), and several official Star Trek novels. This page was last modified on 2 June 2014, at 17:55.